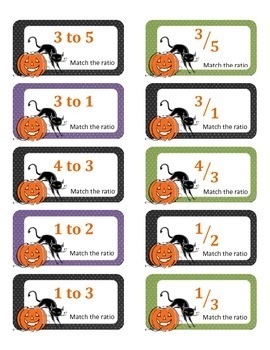 Students will enjoy matching Halloween themed ratios with this card game! 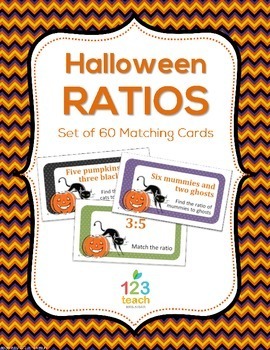 This set includes 60 cards that can be used for many different matching activities. You will need to print and cut apart the cards before using it in the classroom. You can use these cards to match up students with a partner or with groups. All you need to do is pass out one card per student and then the students have to find their match. 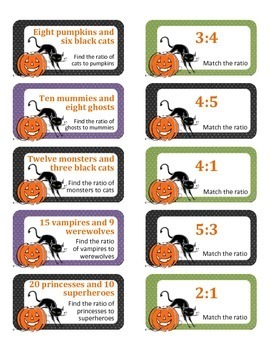 You can also use these cards as a math center as a matching activity or as a memory game. Thanks so much for your download, and I hope you enjoy this free product! You can purchase ALL of my 6th grade Common Core Resources HERE:Common Core Assessments and Activities BUNDLE for 6th Grade Math!